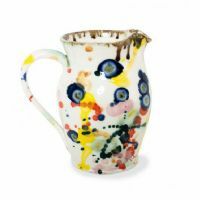 Mia began working with ceramics in 1991, spending seven years as an artist in an English Delftware studio. She then moved into designing and making her own work, spending time learning and working with other potters. Over the years, Mia has had notable achievements and she has even supplied pottery to Fortnum and Mason. Mia painstakingly paints each piece by hand herself, making each one a truly unique and individual work of art.